Footage has emerged this week of methane gas bubbling up through the Condamine River, near Chinchilla in Queensland. Some local landholders say that the gas leaks have been caused by nearby drilling for coal seam gas. Origin Energy denies this, saying the leaks are naturally occurring. The scenes are reminiscent of Josh Fox’s 2010 documentary Gasland, which includes footage of gas leaks in Pennsylvanian rivers. Third Degree's Simon Unwin speaks with the man who shot the video on the Condamine, Dayne Pratzky - a Chinchilla landholder and member of the Lock The Gate Alliance. REDD projects, which take their acronym from their aims of Reducing Emissions from Deforestation and Degradation, are not new to controversy. As an intended carbon offsetting scheme, REDD has been criticised on environmental grounds, as well as the social impact of these projects for local communities. 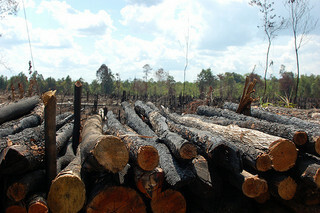 Australia’s REDD project in Indonesia, is now also being criticized for being ‘ineffective’. Professor Stephen Howes is Director of the Development Policy Centre at ANU. In March he co-authored a research paper investigating Australia’s Kalimantan Forests and Climate Partnership. He’s in conversation here with The Third Degree’s Jessica Minshall. Green buildings are buildings that are built to very specific designs not only in order to be environmentally friendly, but to foster an environment that increases productivity, use and the life of the structure itself. This year’s Federal budget cut one of the largest incentives for investing time and money into a green building. The axing of the accelerated depreciation plan means that builders will have very little incentive beyond regulatory demands to go green. Third Degree's Cameron Whalan speaks with Robin Mellon at the Green Buildings Council of Australia.